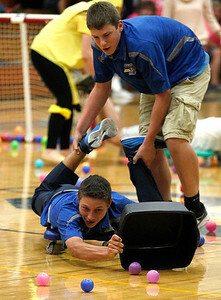 Matthew Apgar - mapgar@shawmedia.com Juniors Casey Wilson swings the legs of Grant Fisher as they play a modified game of "Hungry Hungry Hippos" inside the gym during the homecoming pep rally at Johnsburg High School on Wednesday, Sep 30, 2015 in Johnsburg. Matthew Apgar - mapgar@shawmedia.com Seniors cheer on their team of Abby Majercik and Jack DeStephano during a modified game of "Hungry, Hungry Hippos" inside the gymnasium during the homecoming pep rally at Johnsburg High School on Wednesday, Sep 30, 2015 in Johnsburg. 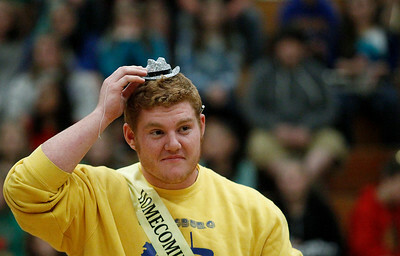 Matthew Apgar - mapgar@shawmedia.com Senior homecoming court member John Conroy looks up to his fellow class members after snapping the elastic to his sparkling cowboy hat during the homecoming pep rally at Johnsburg High School on Wednesday, Sep 30, 2015 in Johnsburg. 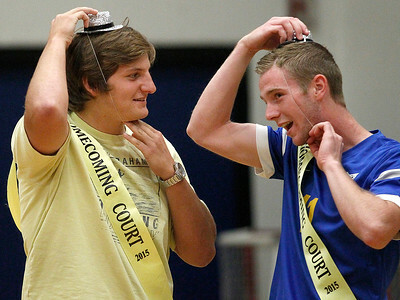 Matthew Apgar - mapgar@shawmedia.com Senior homecoming court members Dillon Tinsley, left, and Nick Whiting put on their sparkling cowboy hats during the homecoming pep rally at Johnsburg High School on Wednesday, Sep 30, 2015 in Johnsburg. Matthew Apgar - mapgar@shawmedia.com Football and boys soccer players join the Hawkettes and cheerleaders for a dance inside the gymnasium during the homecoming pep rally at Johnsburg High School on Wednesday, Sep 30, 2015 in Johnsburg. 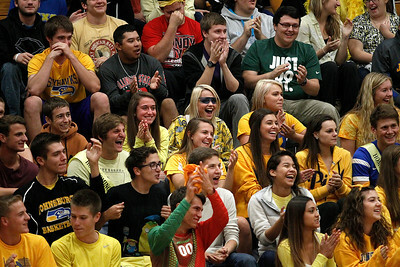 Seniors cheer on their team of Abby Majercik and Jack DeStephano during a modified game of "Hungry, Hungry Hippos" inside the gymnasium during the homecoming pep rally at Johnsburg High School on Wednesday, Sep 30, 2015 in Johnsburg.